A study undertaken by Answer Indiana following the failure of McQuillen’s “sit-lie” proposal found that Black people disproportionately face arrest or citation by the Indianapolis Metropolitan Police Department enforcing existing panhandling laws, including both an Indianapolis city ordinance and a state law making panhandling a misdemeanor. Despite Black residents only making up 28% of the city’s population, 55% of arrests or citations are of Black individuals. 62% of those arrested or cited while experiencing homelessness are Black. In November 2018, Democratic Mayor Joe Hogsett announced a $500,000 plan to “address homelessness” by splitting funding between the Coalition for Homelessness Intervention and Prevention (CHIP) and additional anti-panhandling patrols in the Mile Square financial district by the Indianapolis Metropolitan Police Department. The same night that Hogsett announced his plan, a similar anti-panhandling measure introduced by Republican Minority Leader Mike McQuillen failed when nearly 100 residents of Indianapolis filled the committee meeting room to standing-room only to voice their outrage and opposition. The intent to criminalize homelessness downtown lives on in Hogsett’s plan. Joe Hogsett, who faces major criticism for the rise of violent crime in Indianapolis under his tenure, has apparently taken the belief that he can hang his “law-and-order” credentials on the backs of people who have nothing. In pivoting to a “bipartisan” effort, Hogsett and the Democrats on the City-County Council are looking to enact the same anti-homeless policies as their Republican counterparts after public outcry has passed. This stunning admission was made as a part of Bennett’s comments on the ordinance to change parking meter rules across Indianapolis, which extended metered hours to 11:00 PM Monday through Saturday citywide to fund $500,000 worth of street sweeping and earmark $250,000 for services for people experiencing homelessness. 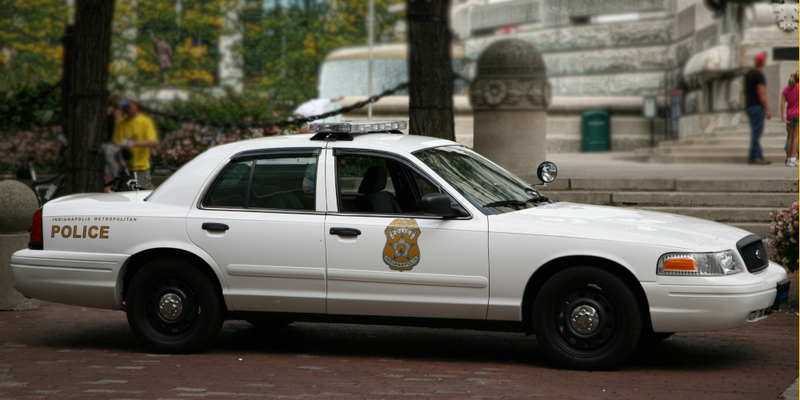 An additional $250,000 was to be set aside for “enhanced patrols” by IMPD of downtown Indianapolis, but an amendment to the parking meter ordinance removed a planned extension of charges on Sunday. Bennett said that funding for the intensification of police presence would have to be found elsewhere. No racist IMPD anti-panhandling patrols downtown! Answer Indiana condemns the bipartisan attempt to pay for police repression on the backs of working people whose parking meter costs are set to rise, despite no hike in parking fees, as meter times were extended by up to eight hours in parts of the city when the City-County Council adopted Proposal No. 448. Police surveillance is being stepped up with mobile camera towers looming over Monument Circle, purportedly to combat the nonexistent “problem” of panhandling. At the same time, two IMPD officers are facing a lawsuit for their inhumane and illegal seizure and destruction of the personal property of people experiencing homelessness. We demand that the City-County Council reject calls by wealthy elites to increase racist police repression in the Mile Square financial district. Deputy Mayor Bennett admitted “we don’t have a significant number of panhandlers downtown,” and public data shows a clear racist bias in enforcement of panhandling laws by IMPD. We call for a united, multinational, progressive, working-class force to fight back against police repression of the poor! Money for people on the streets, not for racist cops on the beat!